Outside In, ed. Robert Smith? Anyway, this episode was... disappointing to say the least. First of all, it was in black and white. Borning! I know each episode is only, like, 26 minutes, but it felt like an ETERNITY. Next time, they should consider making it in colour just because people are not going to pay attention. Sometimes, I just want to ask television studios if they know what their audience wants. Ugh. 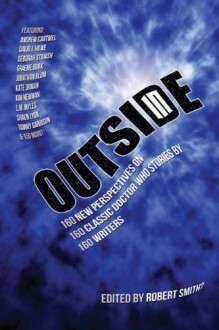 According to the subtitle, this is a collection of "160 New Perspectives on 160 classic Doctor Who stories by 160 writers". I must say it's a very refreshingly different take compared to other guides I have read to Old Who; the variety of voices makes for a very entertaining read. There are some interesting defences of stories which are generally held i low esteem. Steven Warren Hill looks at the Silurians in the context of the Northern Ireland conflict; Matthew Kilburn looks at The Invasion of Time in terms of the British class system; there are lots of entertaining insights, and very few that miss the mark (fewer than one gets in the many books about Old Who where the same author or authors write about each story). JO: Don't kill the Doctor, he's fantastic! Kill me instead! AZAL: Good point. I was just realizing how stupid it would be to kill the Doctor. (KILLS JO). AZAL: I'm the last of my kind, you know. It's very refreshing, and you can get it here.